Final Results Have Been Posted! 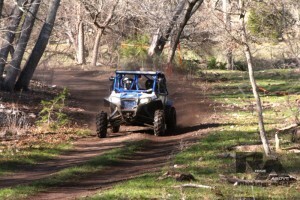 Canyons Offroad Park Buckle winners are Matt Burkett in the Pro 4400 Class and Austin Sides in the Pro UTV Class. Congratulations to all! 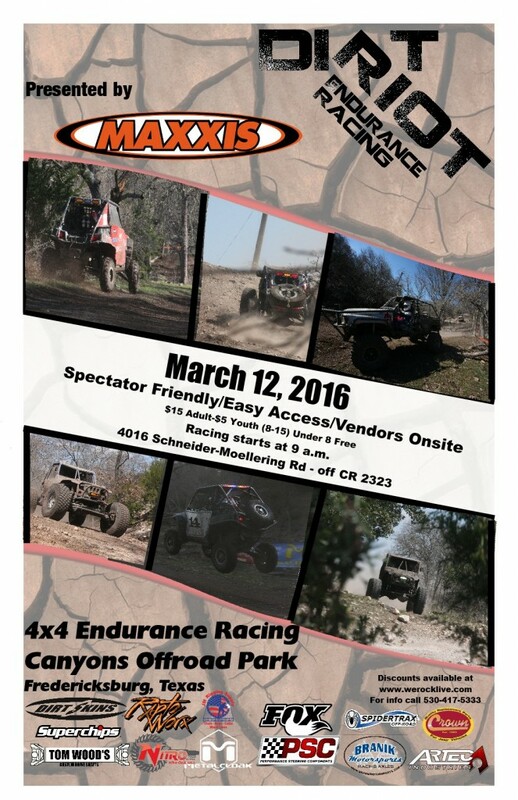 Dirt Riot kicks off the covented Central Series at Canyons Offroad Park in Fredericksburg, TX on March 12th. There will be PRO driver Qualifying on Friday night and fast paced racing all day Saturday. Multiple classes of racers will be hitting the track, from Pro’s to the ability for you to race your almost stock trail rig or UTV. Yes! You can race too! 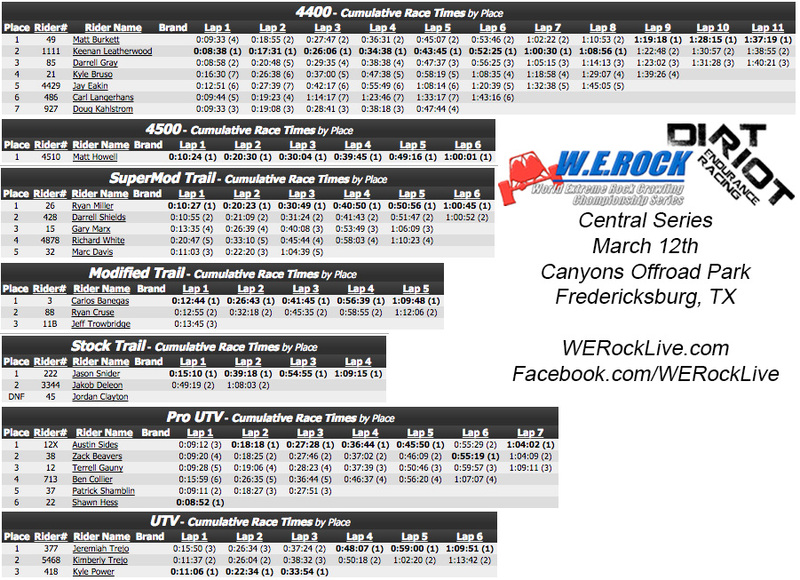 FREDERICKSBURG, TX MARCH 9, 2016: The Central Series Dirt Riot teams will be surprised when they follow the arrows for the first race of 2016. The course is laid out in reverse direction as years past, as well as offering some new trail areas that have not seen racing action in years, if ever before. The offroad 4×4 racing will be perfect combination of fast areas and technical rock areas for the list of Central Series racers that have been racing for years, and for the new racers this year. As tradition holds, winners of the Pro 4400 4×4 Class and Pro UTV Class will receive their cash prizes and a Canyons Off Road custom-made belt buckle. Pre-registered drivers in the Pro 4400 4×4 Class includes Bruso Motorsports Kyle Bruso, Sinister J Racing Jay Eakin, D & D Motorsports Douglas Kahlstrom, Crawling Chaos Carl Langerhans, and K & G Racing Keenan Leatherwood. Pro 4500 Class pre-registered driver is Tribe16 Matt Howell among others not already pre-registered. Pre-registered in the Pro UTV Class are Bad Luck Racing Ben Collier, Hess Motorsports Shawn Hess, and SideXSides Racing Austin Sides. Drivers pre-registered for the SuperMod Trail Class include Team FGS Racing Marc Davis, American Patriot Racing Gary Marx, and Dirt Cheap Racing Darrell Shields. Other pre-registered drivers include JKP Racing Jeff Trowbridge in the Modified Trail Class and in the UTV Class Bully Racing Kimberly Trejo.